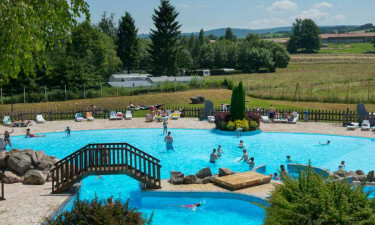 Nestled in the beautiful countryside of the Vosges Mountains and valleys, Domaine des Bans is a luxury camping site ideal for adventurous families. With many natural sites, historical towns and culinary delights to explore in the region, it is the ideal base for discovering Alsace and Lorraine. 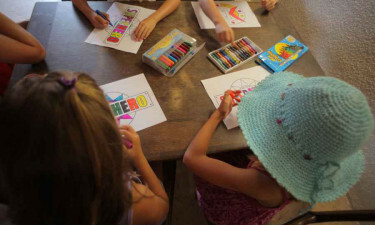 Domaine des Bans has on-site activities, entertainment and leisure to ensure a relaxing vacation for all the family. Located in Corcieux, Domaine des Bans is set in a huge natural park area with its own 33 hectares of tranquility. With popular and picturesque medieval towns like Munster and Kaysersberg in the vicinity for day trips, your family can choose to revel in culture or be surrounded by nature. Domaine des Bans' mobile home accommodation sits at an altitude of 560 metres with many breathtaking views waiting by your window or terrace. 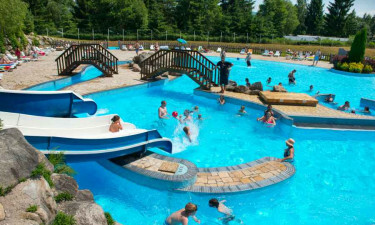 Book your next camping holiday at Domaine des Bans through LuxCamp. Why choose Domaine des Bans? Clubs for children aged 5 to 17. Multi-sports pitch and games room. 3 natural lakes for fishing and canoeing. Entertainment room with television and billiards. With a semi-Olympic-sized pool and aquatic leisure area with slides, 'rivers' and paddling pools, there is something to delight all ages, young and old. With aqua gym activities to keep fit and relaxed, Domaine des Bans also offers a gorgeous view from the comfort of your deck chair. If the weather gets nippy, a heated and covered pool awaits you. Set within a natural park, there are many opportunities to hike, trek, horse ride and mountain bike the area. Horse riding, skiing and fishing are available nearby for a fee, and there is a mountain bike rental on site. With recommended trails and lakeside rentals (canoeing, kayaking), Domaine des Bans is ideally placed for a host of natural activities.